OMAX’s co-founder and CEO, Dr. John Cheung, has always expressed after-sales service as a touchtone of the OMAX experience. 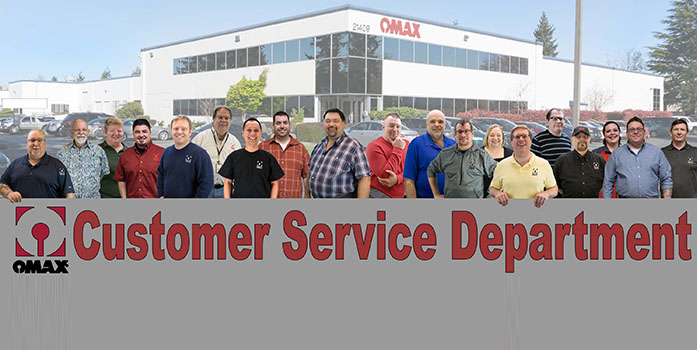 As part of your OMAX abrasive waterjet purchase, you have complete access to OMAX’s superior customer support. From software installation issues to question on cutting methods, our staff is trained to answer any and all questions that you may have. Often when you experience an issue that may need customer support, support may ask you to run and submit an OMAX Technical Support Report. This report includes most of the information the technical support staff will require to understand your problem. In addition, the Technical Support Report allows OMAX to reproduce your problem at OMAX (the report includes your settings files, which can be loaded into MAKE to exactly reproduce your settings). In other words, you will get a faster and accurate answer if you e-mail the Technical Support Report. To run this report open OMAX MAKE, click on “Help and Reference”, then select “Create report for technical support…” Make sure to fill out all yellow boxes as that will allow Customer Support to look up what OMAX machine you are using as well as supply a method for them to get back in contact with you. Use the “Additional notes” field to describe your problem (or the symptoms). You can also include the best time to contact you, and any other information you think might be useful to help solve your problem. One note about emailing your report to OMAX: The E-mail button uses OMAX’s e-mail server, so you do not need to use your e-mail account. Note, however, that this means that unless you supply your e-mail address, OMAX Technical Support will not have your e-mail address to send you an answer. Phone and email support for your OMAX machine is always free and never expires for original owner. If you have bought your OMAX abrasive waterjet second hand, you are able to buy into the support program. You get the help you need, when you need it for as long as you own your OMAX abrasive waterjet.